Note: Given my steadfast refusal to write negative comments, I am no longer calling my posts on albums/concerts reviews. If being a reviewer means I have to say the bad along with the good then I am hereby resigning as a reviewer. If you are reading something I wrote, you can bet it is something I liked. Years ago, the phrase “sefira music” would have been considered an oxymoron. But there is clearly a market for this genre and artists everywhere are attempting to take advantage of this relatively new phenomena. 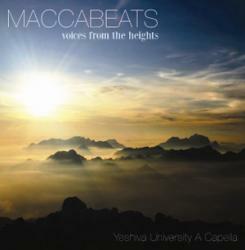 While AKA Pella has made a name for themselves by releasing new albums just before Pesach, this year they had company, with the release of Maccabeat’s debut album, Voices from the Heights. If you have never heard of this talented a capella group before, Maccabeats features the voices of fourteen men from Yeshiva University, though two are actually alumni of the yeshiva. Their sound is traditional a capella, with rich full harmonies featured throughout their very varied song selections. These guys have awesome voices and they know how to use them. Plain and simple, they take a capella to a whole new level. This album is jam packed with gorgeous voices, amazing harmonies and fabulous arrangements on each and every song. Ma Rabu – If you read my review of London Girls Choir’s Silver Lining, you will know that this was, hands down, my favorite song on the album and I love that this song is being introduced on a men’s album so that the other 49% of the population can hear it. It is a great choice for an opening song, with intricate harmonies that give the Maccabeats an opportunity to strut their stuff. I was disappointed that while they used just about all the harmonies that Dina Cohen used in the original song, they skipped my favorite – a jaw droppingly gorgeous low harmony at the end of the song. But no matter, the Maccabeats start off strong and leave you dying to hear how they are going to follow up this terrific opener with fabulous arrangements by group leader Julian Horowitz. Arim Roshi – This hauntingly beautiful song, the title track of Shai Gabso’s 2004 album is “a poster song for the IDF and the war against Hezbollah” according to Wikipedia. It is truly beautiful and I wish the booklet had the lyrics, because they are not easy to pick out, especially with all the accompaniment the Maccabeats provide in the background, though a quick google search can provide the lyrics. Former Miami Boys Choir member Chanina Abramowitz does a great job with the arrangements. Aleinu – This is probably my favorite song on Yehuda’s Generations of Song and it is so well suited to the Maccabeats. Love it!! Oseh Shalom – This 2008 song, written by Stephen Levey to honor of the 60th anniversary of the state of Israel, was one of those “get a whole bunch of people together to sing for a good cause” songs. It isn’t my favorite on the album, but on an album like this, that’s not saying much. It is amazing just how much you can do when you are working with fourteen talented guys! HaMalach HaGoel – This medley starts with the ever popular words of Kriyas Shma set to Brahms lullabye and then segues into the classic Dveykus Hamalach, followed by the Shloime Dachs version. Best part of the medley is the beautiful harmonies at 3:26. Go The Distance – Again, no lyrics! There are so many gorgeous vocals that I wish I didn’t have to listen to catch the lyrics and I could focus even more on all the stunning elements that the Maccabeats use in this fabulous Alan Menken song, the title song from the Disney movie, Hercules. Listen at 3:33 to hear soloist David Block singing with no accompaniment whatsoever. Wow, what a voice!! Shaleshudis Medley – I knew there had to be some “doo wops” somewhere in this album and they finally surface at the beginning of this two song medley, starting with Ein Aroch (from Michoel Streicher’s Thank You album (thanks, Joel!! )), another gorgeous song that was just born to be sung by the Maccabeats. A nice instrumental bridge to the tune of (or for any of you who have ever gone to a boys camp or had a son in camp, TTTO) the classic Yedid Nefesh, followed by one of my all time favorites, the Dveykus 2 Kol B’rama, sung by none other than Yeshiva University President Richard Joel. Ma Avarech – I am guessing that this Israeli folk song is older than any of the guys singing it on this album. I don’t know that I love the song, but they do a good job with it. Hatikva – Don’t shoot me, but I am guessing that this may be the first time my kids have heard the Israeli national anthem. It is a gorgeous song and, once again, the Maccabeats do it justice. One Day – We have always had a no-Matisyahu rule in my house but, somehow, this song seems to have snuck under the radar, probably because the first time I heard it, it was being sung by Benny Friedman and Ari Boiangiu at the very end of a wedding. I didn’t realize it was a Matisyahu song and I liked it. Couple that with the fact that my kid has been playing it over and over again on the piano and it just kind of grew on me. Anyway, the Maccabeats don’t overemphasize the Reggae feel of this song, so the simple beauty of the song and lyrics shine through. A fabulous closer to an absolutely fabulous album. great…um what do i call it? whatever, nice write up!! Great article! Its pretty impressive to hear how musically advanced they are as a whole… Its also very pleasant to listen to all year round! I am trying hard to find the lyrics to “Ma Ruba” but am coming up empty in every search I try. Any ideas?